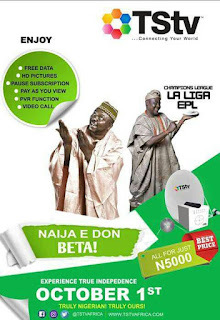 Also report from independent News says that DSTV, Star times and other Pay TV in the Nigerian market are in Panic with TSTV set to lunch on October 1st even after TSTV has officially come out to say it not here to rival existing players in the industry. One if the rumours circulating the internet especially on social media platform like Facebook, twitter and whatsapp is that TSTV may not lunch on October 1st (Nigeria's Independence day) because of some issues the pay TV owners are facing with the Government. The fact is that, those are not true at all, according to a statement by TSTV via their Facebook page. The message ask all Nigerians to disregard the rumour assuring the general public that TSTV will lunch on October 1st. The message reads "Telcom Satellites Ltd owners of “TStv Africa” wishes to inform the general public that the official unveiling and launch of “TStv Africa” PayTv brand on 1st October, 2017 remains as scheduled.Kindly disregard any information to the contrary. TStv Africa remains committed to offering Nigerians unique and exciting digital Pay TV viewing experience in a single and affordable bouquet". The next one is about some persons posing to be TSTV agents, asking people online to pay the sum of N5000 to their private account to pre order the TSTV complete package. Please disregard these scammers online, TSTV has no pre order service and the sale of the TSTV decoder and other accessories shall be done from the Lunch date of October 1st, 2017. TSTV also issued a statement concerning this, and it reads "DISCLAIMER!Telcom Satellites Ltd owners of “TStv Africa” boldly dissociates itself from some fraudulent online persons and posts requesting unsuspecting members of the public to pay the sum of #5000 naira for TStv Africa decoders and other various sums of money for subscriptions into their private bank accounts.We wish to state here for the umpteenth time that TStv Africa has neither commenced the commercial sale of its decoders nationwide nor requested any person(s) to pay for any decoder or subscription whatsoever.An official announcement will be made available onour authentic website and social media handles concerning the commercial sale of TStv Africa decoders to the public. Do not be deceived!" 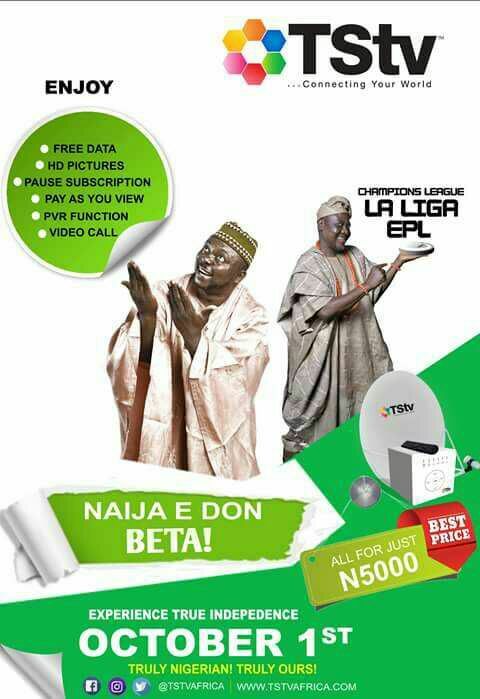 " #Pausesubscription, #PVRfunction, #Videocall, #freedata, #500GBstorage space, #wifi/ hotspots function, # over 70 channels, #free one month subscription and lots more" for N5,000. Evil doers your plan to derail TSTV will not come to past. No be lie sha . nice one.